Contents: R.H. Dana, Cross-Cultural and Multi-Ethnic Assessment. Y.S. Ben-Porath, Cross-Cultural Assessment of Personality: The Case for Replicatory Factor Analysis. I. Savasir, N. Erol, The Turkish MMPI: Translation, Standardization, and Validation. A. Wilson, S.D. Passik, M.F. Kuras, An Epigenetic Approach to the Assessment of Personality: The Study in Instability in Stable Personality Organizations. T. Osberg, J.S. 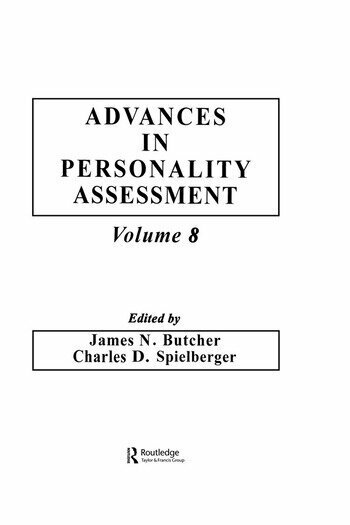 Shrauger, The Role of Self-Prediction in Psychological Assessment P. Lerner, H. Lerner, Rorschach Measures of Psychoanalytic Theories of Defense. S. Walfish, R. Massey, A. Krone, Conducting Psychological Evaluations with AA-Oriented Alcoholism Treatment Programs: Implications for Practical Treatment Planning. J. Strelau, A. Angleitner, W. Ruch, Strelau Treatment Inventory (STI): General Review of Studies Based on German Samples. L.A. Clark, Toward a Consensual Set of Symptoms of Clusters for Assessment of Personality Disorders. "Readers will find this volume intellectually stimulating and practically useful, and the book is recommended to practicing clinicians and researchers in personality assessment and theory alike."